At Fashion Island Newport Beach St. John Knits, we’re here to help you discover a wardrobe that’s both modern and effortless. Whether you’re looking to get outfitted for a luncheon or evening event, our stylists are dedicated to providing you the personalized and luxury shopping experience you’d expect from St. John. While visiting us, discover our many client services including alterations, in-home delivery and one-on-one fit and style consultation. For more information, inquire at the boutique or please call us at 949-258-8750. Mirroring Fashion Island’s elevated, yet relaxed approach, the Fashion Island St. John boutique is inspired by the quintessential California living. Visitors will discover a collection that speaks to a modern clientele with an elegant sense of style. Known worldwide as Orange County's premier shopping center, the boutique is located on 565 Newport Center Drive in Fashion Island. The boutique's light and airy palette of colors will welcome you as our experienced wardrobe specialists give attentive, one on one styling. 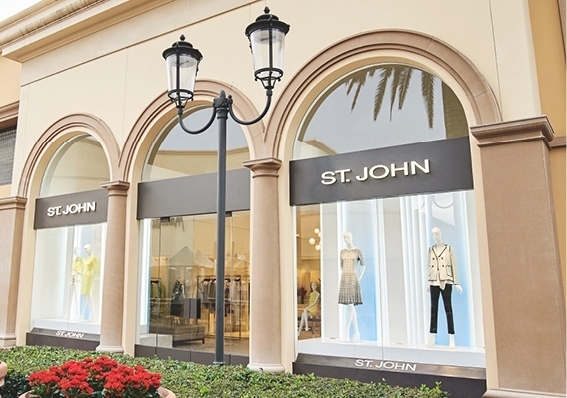 As soon as you step into St. John at Fashion Island, you’ll experience all the luxury that’s synonymous with the brand. Our standard for incredible service and impeccable attention to detail is matched only by the iconic craftsmanship of our knit jackets, dresses, gowns and more. We practice craft and couture. With iconic American design as our heritage, we invite you to experience first-hand, the meticulous hand-applied details, the craftsmanship, and one of a kind embellishments that have become synonymous with St. John Knits. Visit us at the St. John Knits Fashion Island boutique and we will personally guide you through the range of St. John collections, and allow you to see the effortless, alluring and refined clothing that has appealed to women all over the world since 1962.